I'm fairly certain this is a 1960 '59 Ford F-250 4x4 (please correct me if I'm wrong). This is such a cool shot of a beautiful truck. I had never wanted anything high-rise until I saw this. Styleside beds were very popular when Ford built them and they still look great today. Be great to drive to work in this then head off to the beach, snow, mountain, mud, whatever, it will get you there. Update: Blair let me know this is a 1959. 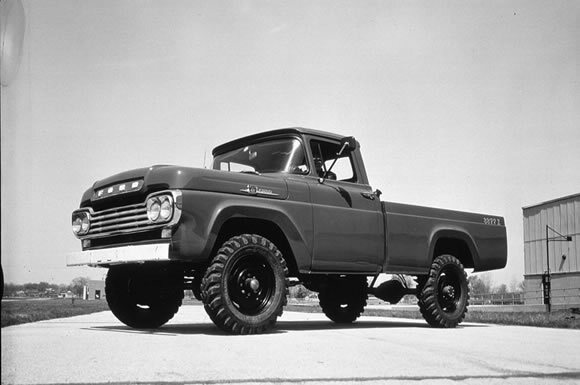 "Hey Glenn, this is a '59 F250 4x4, the first year Ford introduced factory 4x4's. Still see a few of these around over here and many in great condition. Wouldn't be too good running one on NZ's petrol pricing though!"